CHEMIA S.p.A. is an Italian private company working in the fine chemicals and in the production of pesticides and fertilizers. CHEMIA was founded in 1962 and is one of the oldest brand in the Italian agro chemical industry. Over the years it has consolidated its position in both national and international market. Nowadays, CHEMIA leads the manufacture of products of all toxicological classes and the formulation of wettable powders, emulsifiable concentrates, micro and macro granulates, flowables, microencapsule suspensionsand water dispersible granules. The range of formulates that CHEMIA produces offers the most complete solution to the ever-changing needs of the market. Every new product is planned to reduce the impact on the environment, decrease any risk to the operator and improve the efficacy of the treatment. CHEMIA is specialised in providing the service of formulation and packaging to third party companies in Italy and abroad. The supply of finished and semi-processed products is tailor-made to comply with the customer needs for packaging, labelling and shipping. CHEMIA put the needs and the satisfaction of its customers as the first place. The mission of the company is the constant pursuit of the highest standard of quality, safety and respect for the environment, not only for its products but also for all the tasks it carries out. CHEMIA’s policy is based on the will to achieve an excellence that can be seen and measured. 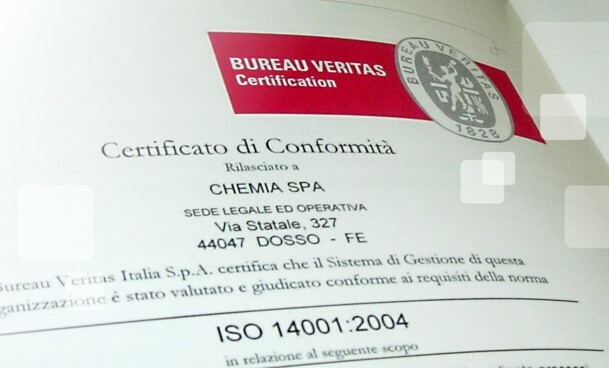 CHEMIA has got the ISO 9001 and ISO 14001 certifications and implements rigid safety measures in order to carefully monitor environmental factors linked to production processes and continually improve the work place. The Company’s strategies are aiming to better technological and organisational solutions for a sustainable agriculture, saving energy and safeguarding the environment. Recent European and Italian agricultural and environmental policies incentive agricultural practices that have less impact on the environment. The new agro-chemical products now available on the market confirm the principle of using environmental friendly technical means to defend crops. It is well known that the effectiveness of a pesticide depends on the formulation. The concentration of active substance and the effect on a pest is influenced by various factors such as the physical form and the method of administration or use. In addition to this, the action of the active molecules depends on the physical and chemical properties of the formulate. CHEMIA pays great attention to safety and environmental factors and directs all its energies in creating easy to use and safe to handle products. CHEMIA collaborates closely with universities and private laboratories on research projects for more effective and highly innovative formulations. CHEMIA has developed a series of products for organic agriculture as well. CHEMIA has also recently developed biocides for public health. Quality Control in CHEMIA is a key step in the manufacturing cycle and it is carried out by an internal laboratory that checks both raw materials and finished products. CHEMIA’s staff are well aware that high purity raw materials are needed to make high quality products. The internal QC laboratory has analytical instruments that provide a high degree of accuracy, flexibility and speed. Analyses are carried out using official analysis methods in compliance with F.A.O. , A.O.A.C. and C.I.P.A.C. specificantions. The products are constantly monitored and certified by an experienced team of specialists.